(Nanowerk News) Renewable wind energy is experiencing a boom, with more wind turbines popping up across landscapes in the U.S. and abroad. 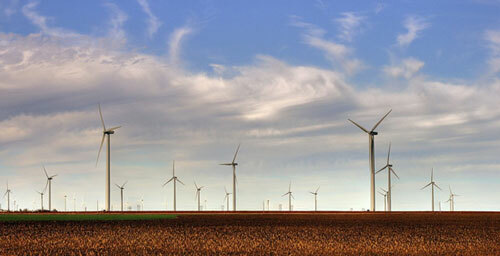 Indeed, wind energy accounted for 3.3 percent of electricity generation in the United States in 2011, according to the U.S. Energy Information Administration. Globally, that number was 2.9 percent for the same year. The Smoky Hills Wind Farm as seen from Interstate 70 in Kansas. Atmospheric science professors Nate Brunsell and David Mechem in KU's Department of Geography are co-authors of a new study just published in the Proceedings of the National Academy of Sciences ("Two methods for estimating limits to large-scale wind power generation") by an international research group that evaluated the effects of large wind farms on atmospheric flow and its implications for how much renewable energy the turbines can generate. "Wind turbines generate electricity by removing energy from the wind, so a larger number of wind turbines should result in a slowdown of the winds in the lower atmosphere," Mechem said. "When just a few wind turbines are installed, each additional turbine results in a similar increase in electricity generated, as you might expect," Brunsell said. "Instead, because the turbines extract energy from the wind, additional turbines will each generate less and less electricity," Mechem said. The team's simulations estimate this slowdown effect results in a practical upper limit of 1 megawatt per square kilometer that can be generated -- far less than previous estimates not accounting for the effect. Current wind farms are operating well below this generation limit, but the authors found that this slowdown effect needs to be accounted for, particularly when comparing different sources of renewable energy.